The green outlined areas are where trees are planned to be planted in Pocopson in 2018. POCOPSON – Township supervisors expressed excitement on Monday evening, unanimously approve a grant application to plant 800-850 trees on township property. Chair Ricki Stumpo, Vice-Chair Elaine DiMonte and Supervisor Alice Balsama were quick to approve the motion for the application of the TreeVitalize Grant Landowner Agreement (approximately $10,000) initiated by the Brandywine Conservancy. TreeVitalize Watersheds, is led by the Pennsylvania Horticultural Society (PHS) in the five-county southeastern PA (SE PA) region. Tree planting focuses along stream corridors, wetlands, adjacent upland areas, headwaters, and “naturalized” stormwater basins. Projects are conducted throughout the region every year, resulting in thousands of trees planted. The program is made possible by funding from the Pennsylvania Department of Environmental Protection (DEP), Aqua PA, and contributions. Meredith Mayer, Associate Planner for the Brandywine Conservancy, presented the plan to the supervisors. The request for grant funds will be submitted by September for a mixture of native trees to be planted on Pocopson Township property along the park’s streams. The planting for the township will occur in two phases – Spring and Fall of 2018. The first phase includes planting 350 trees in a cluster along the stream behind the Barnard House on Wawaset Road – and the remaining trees adjacent to the stream along Lenape Unionville Road. “We have never been denied a grant application. PHS is really generous in giving them out and is trying to plant a million trees,” Mayer said. Plant One Million is also led by PHS and the goal is to plant one million trees throughout 13 counties in southeastern Pennsylvania, New Jersey, and Delaware. 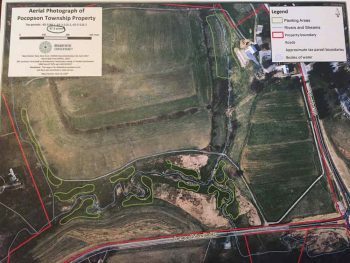 Mayer sought approval for the township to maintain the mowing and necessary spraying, according to the grant’s requirements. “It’s not really a massive commitment on the part of the township and you can get credit on your stormwater permeation,” Mayer said. Township Director of Public Works Mark Knightly estimated an additional two hours of work per week to mow between the trees and maintain the trees in the area that is already part of the current workload. Volunteers to help with the planting will be solicited from the community, the conservancy, and possible businesses, and the opportunity will be advertised on the township website. “Maybe the supervisors can get out and plant some trees,” DiMonte added. The supervisors signed the TreeVitalize Grant Landowner Agreement prepared by the Brandywine Conservancy for the installation of 800 – 850 trees to be planted on 67.3 acres of township property. The Parks, Recreation and Trails (PRT) Committee submitted a draft proposing changes to the park’s reservation rules, specifically addressing the need to have a process in place to reserve the highly sought-after sports’ fields located in Pocopson Park on Locust Grove Road. The supervisors will submit the recommendations and edits and have the township solicitor review the liability verbiage. The township solicitor will also review the Emergency Management Services (EMS) Task Force’s organizational documents and ordinance. The process to obtain volunteers for the new commission – consisting of members from neighboring townships to mandate spending and allocation of funds for the three fire companies- is underway and will be advertised on the township website at www.pocopson.org. The supervisors also reviewed a proposed letter from the PRT informing affected residents about the initiative to connect the trail system via open space property within a few developments along Route 52. The supervisors agreed to have the PRT Committee notify the affected Homeowner’s Associations prior to moving forward with the notification to seek approval from the residents.